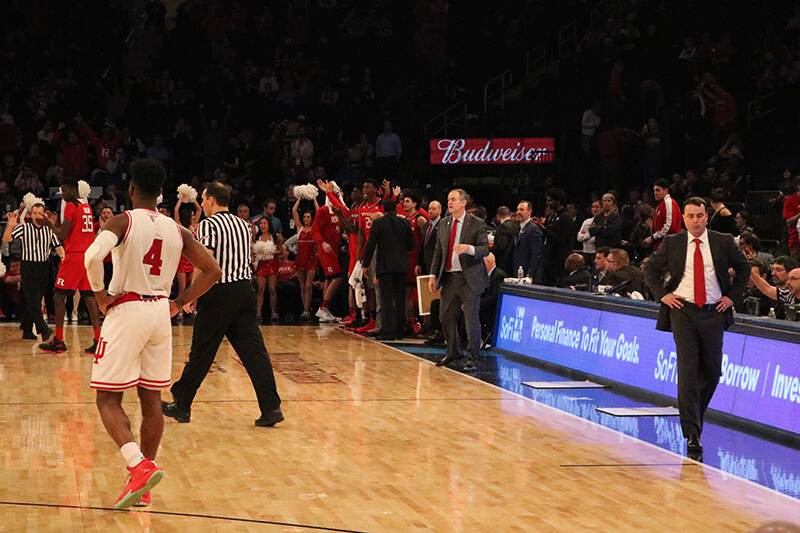 Indiana’s trip to New York City for the 2018 Big Ten tournament was brief as the Hoosiers fell 76-69 to Rutgers on Thursday night at Madison Square Garden. The loss dropped Indiana to 16-15 and likely ended the season for the Hoosiers. · Strong start quickly fades away: Indiana came out of the gate strong on Thursday night. The Hoosiers had a commanding 24-8 lead and Rutgers appeared to have no answer for the Hoosiers. But the momentum didn’t last long. By halftime, Rutgers had taken a one-point lead. And the Scarlet Knights opened up an eight-point cushion multiple times in the second half before closing out the Hoosiers in the most shocking result so far in this year’s Big Ten tournament. So what happened to Indiana? Rutgers deserves credit for playing well, but the Hoosiers simply lacked the confidence, execution and focus to win on the big stage. · A disappointing end to the season: After beating Iowa 84-82 on Feb. 17, Indiana looked it might make be on its way to an NIT appearance. But with losses to Nebraska and Ohio State to end the regular season and the loss to Rutgers, the 2017-18 campaign appears to be over. Archie Miller acknowledged that he would be “surprised” if the Hoosiers had a postseason appearance on the horizon and also shot down any chance that the program would participate in any tournament other than the NIT. Despite a mid-February four-game winning streak and signs of improvement for a majority of the season, Indiana finished with a 4-7 record over its final 11 games. · Rutgers shreds Indiana defense: The Scarlet Knights had the Big Ten’s worst offense in conference play, but you’d never know it based on their performance on Thursday. Rutgers scored 1.12 points per possession, their second best mark against a Big Ten opponent this season. The Scarlet Knights also had an effective field goal percentage of 62, their best mark of the season so far against a Division I opponent. Indiana’s defense, which was ranked as the Big Ten’s best at one point late in the season, gave up 1.09 or more points per possession in three of its final four games. Juwan Morgan said postgame Indiana’s defense was definitely to blame in the loss. · A tough ending for IU’s senior guards: This was not the ending that Josh Newkirk and Robert Johnson envisioned for their IU careers. Johnson went just 4-of-16 from the field in the loss and Newkirk was 1-of-7. The career of Johnson has been underappreciated by some fans, but the senior from Richmond (Va.) deserves a nod for all of his contributions over the last four years. A top 50 recruit out of high school, Johnson was never the focal point of IU’s offense, but was always a steady and reliable contributor on both ends of the floor. Most importantly, he always conducted himself as a class act both on and off the court and was a great representative for the program. · Rutgers limits Morgan’s effectiveness by denying him the ball: Juwan Morgan had another strong overall performance with 15 points and nine rebounds, but the Hoosiers had a tough time getting him the ball in key spots. As a result, Morgan only attempted nine shots and when he did managed to get the ball, he was often hounded at the rim by Scarlet Knight defenders. “I thought they did a great job of establishing that they weren’t going to let Juwan catch the ball,” Miller said. “And usually we can play through him. This team really relies on being able to play through him. some people in their 30’s and 40’s kid…..are you going to condemn me for that? Never had any backlash from it. It is all about affinity and the way it is delivered. Knight obviously likes Archie and the way Archie coaches. It was Knights’ way of showing affinity for Archie.